My husband, Neal, and I have been on the Nutrisystem program for a full 6 weeks now. This week actually marked our halfway point through our 12-week Nutrisystem journey. If you haven't been keeping up with our weekly posts you can catch up here. 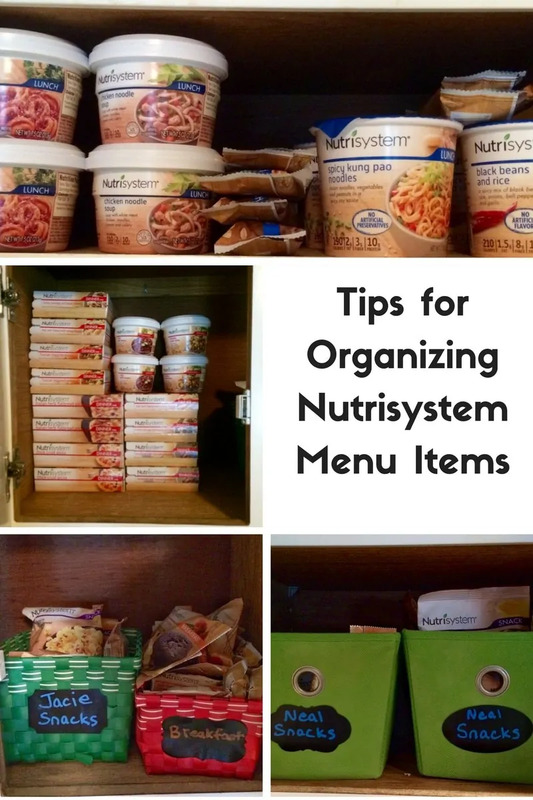 Before I dive into the results of our weekly weigh-in I want to talk a little bit about how I organize our Nutrisystem menu items. While my husband would have been happy to keep the shelf-stable foods sitting in the box they arrived in, pulling out meals from a box just isn't natural for me, and that simply wasn't going to do. I knew that I had to make the food a part of our home, and unpack them like I would any groceries. Lunch and dinner items I simply stacked neatly on shelves. This is simple because of the shape of the items. Breakfast and snack items, on the other hand, are more oddly shaped and not as easy to stack. So, I gathered some mismatched storage bins that I had around the house and sorted our snacks and breakfast items into the bins. I labeled the bins using chalk markers and chalkboard labels. Viola, our Nutrisystem food was organized in under 10 minutes. 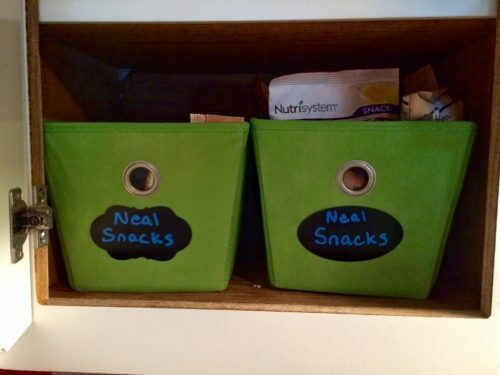 Having all of our Nutrisystem menu items organized and in our cabinets helps to make meal-planning and grabbing snacks as easy as possible. We don't have to search, everything we need it right there and easy to find. We also have a wide variety of frozen Nutrisystem menu items. I sorted the items in the freezer by meal and did my best to stack them. Stacking is easy when it comes to the dinners but not as easy when it comes to lunch items, breakfast items, and desserts. 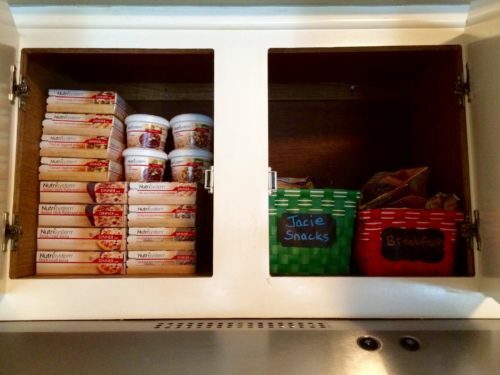 I did my best, and utilized the freezer door compartments to store the smaller items. Wow! Even though we just hit the halfway mark of our 12-week Nutrisystem Program, we are both more than halfway to our goals. Neal is actually very close to hitting his goal, at which point he will just need to maintain his weight. On the other hand, even once I reach my 25 pound goal that I set of this 12-week program, I still have a lot more weight I want to lose. Now as we begin the second half of our Nutrisystem journey and I am beginning to worry about what will happen when it ends. I wish I could stay on Nutrisystem forever! Nutrisystem makes it easy to make healthy choices by filling your fridge and cabinets with perfectly portioned and delicious meals. The program works. Hubby and I are living proof! In just 6 weeks we have lost over 15 lbs each! Be sure to keep an eye out for next week's post to read how we do with out next weigh-in. Thanks for sharing these great tips. Keep up the good work. This is really nice , I hope this all works out for you , if nurtra system helps then thats a big plus.